The 17th edition Leeds training course is theory-based with no practical elements. Recently revised in line with Amendment 3 of the IET Wiring Regulations, our 17th edition Leeds training course will ensure you have fundamental working knowledge of the Wiring Regulations and the requirements placed upon you. Taking place in a classroom environment over a period of three days, our experienced tutors will guide you through the Wiring Regs in an easy-to-understand manner. All those wanting to work in, or currently working in, environments requiring 17th Edition qualifications will need to complete the 2382-15 17th Edition. It is ideally suited to those already in the electrical industry who need to update to the new regulation standards or those who are fairly new to the industry and haven’t yet studied for a 17th Edition qualification. As the 17th Edition is the basic qualification for most people wanting to work with electrics, once successfully completed, the 17th Edition qualification will allow progression to further more advanced level courses. Any prior electrical knowledge will be an advantage, although not essential. All learners must be interested in the subject matter and willing to learn in order to gain entry to this course. 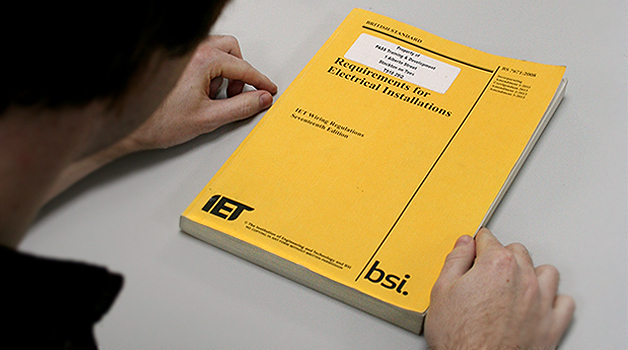 All candidates should read and bring with them a copy of the latest edition of the IET Wiring Regulations. Want to study towards a 17th edition qualification in Leeds? This industry-standard City and Guilds course is an excellent solution for anyone looking for this qualification. Our 17th edition Leeds training course follows the course syllabus of 2382-15 which takes into account the changes made under Amendment 3 of the IET Wiring Regulations (2015). Having a fundamental knowledge of the Wiring Regulations is essential for anyone involved in any part of an electrical installation’s design, implementation and upkeep. This course is suitable for electricians, managers, duty holders and anyone else involved with electrical work, and it is a legal requirement to ensure that any work carried out adheres to the 17th Edition Wiring regulations at all times. Note: those who have attended 17th edition training in the past need to update their knowledge to include Amendment 3 of the Wiring Regs. You should retake this course to ensure you’re up to date with this content.